Oh, DQ...sweet memories of suburbia and drive through ice cream. 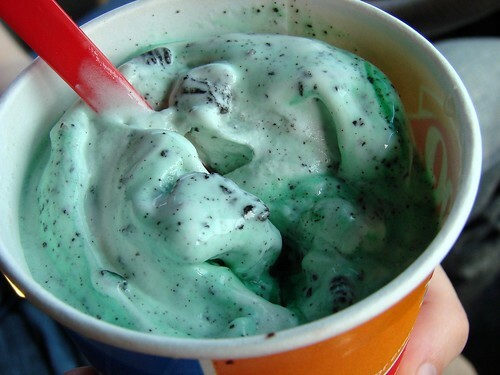 I wish I could love the Shamrock Shake for it's kitschy green seasonality, but in my book the Mint Oreo Blizzard is the undisputed king of the artificial mint tinged ice cream beverage category. What's your favorite summer ice cream treat? My favorite summer treat is a Nestle Tollhouse Chocolate Chip Cookie Ice Cream Sandwich...SO good. That and an It's-It!!! frozen fruits or frozen yogurt. or just a slice of juicy watermelon. That Mr. Softee combo is my absolute favorite! 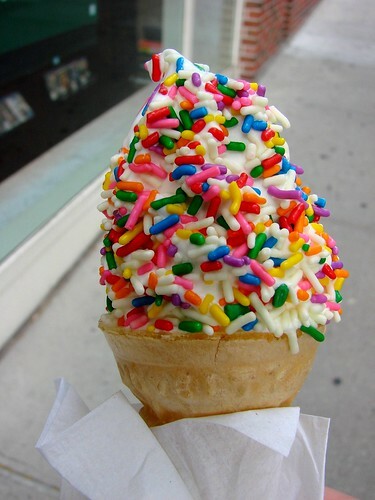 Vanilla Mr Softee with rainbow sprinkles is also my all-time favorite. As an alternate, I love the choco-crunchies with choco-soft serve. Reminds my of Carvel b-day cakes when I was a kid. Yum.